But he is also arguably the most polarising – and powerful -- political leader in India since the Late Indira Gandhi. Having led the BJP to a massive 283 seats on its own (well over 300 with allies) in the 2014 elections – the first time a single party won a majority on its own in 30 years -- Modi, 68, has spent the past five years leaving his imprimatur on the Indian body politic. 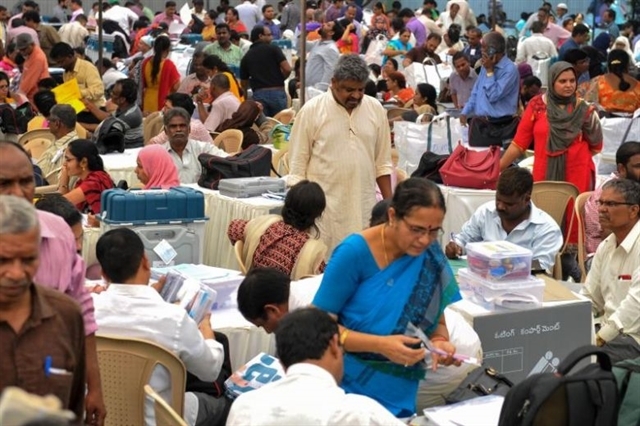 Over 850 million voters are set to vote in the first phase of a marathon seven-phase general election in India which kicks off on 11 April (Thursday) with 91 constituencies voting. Results will be announced at one go on 23 May once all seven phases of polling are over. India elects 543 members to the Lower House of Parliament or Lok Sabha (People’s Assembly) in its parliamentary form of democracy following the first-past-the-post system modelled on Westminster. The Lok Sabha has a five-year term but can, and on occasion has, been dissolved before its term is complete by the ruling party. A simple majority is 272; the leader of the single largest party or pre-poll coalition is then invited by the President of India to prove his/her majority on the floor of the Lok Sabha. Technically, all contestants fight the election on party tickets and then the winning party chooses its leader (who is appointed Prime Minister). The supervision of the entire election process -- from the date of announcement of the polls till the results are declared -- is in the hands of the Election Commission of India, a Constitutional body. General Election 2019 is the 17th since India gained independence in 1947; the first was in 1952.